These are full instructions for how to go after CPU Frequency World Records on Bulldozer. This is a cleaned up and prettier version of my original Bulldozer overclocking instructions published on the forums, so I suggest you become a forum member to follow the bleeding edge developments that go on regularly there. Hopefully this will be helpful for anyone out there with Bulldozer and Liquid Nitrogen, and for everyone else I hope it uncovers the secrets of how its done. It worked for me to the tune of 8.06GHz and currently 17th place in the world (Update: Improved to 8.235GHz 4th place in the world). Why share the secrets? 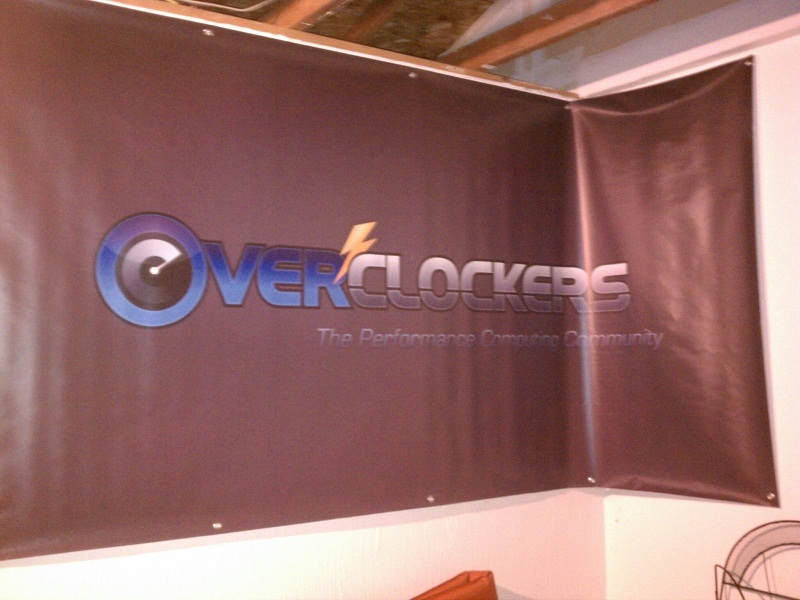 I only know this because of what Overclockers Forums has taught me over the years, and this site was founded on sharing our experience – its what inspired me to start in this overclocking hobby. I go after records like this with intent to kill something, but if you somehow don’t kill anything doing this, please don’t blame me that everything survived. 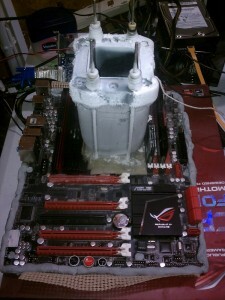 I learned this from Phenom II experience: AMD 965 BE @ 6.861 GHz, AMD 975 BE @ 7.035 GHz, and AMD 980 BE @ 7.002 GHz. On Bulldozer, I’ve bought 2 CPUs so far: an FX-6100 @ 7.744 GHz and an FX-8120 @ 8.060 GHz. I also was observing at AMD in Austin while Chew* and Macci were breaking the world record earlier this year. At the request of AMD, I provided independent “expert testimony” on what I saw when they applied for the Guinness book of World Records. This is not hard however this article is a bit long because I have spelled out very specifically what to do. Refer to the headings below if you’d like to skip to the part you are looking for. Ask in the comments if you have any questions. 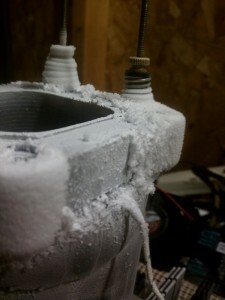 Keep in mind everything below was done at -190C/-374F at the base of my cooler. 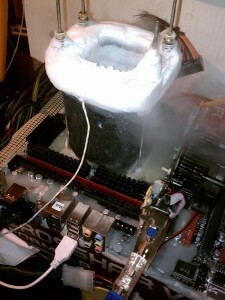 If you attempt this on air or water cooling please post including pictures and video. I’ll write your name in the “good” column in my journal if it catches fire. Download PSCheck 3.4.1. This is where people typically make ominous statements about things being potentially dangerous. I have read where other people have said PSCheck could kill your chip, but I’m not going to say that myself – it is a tool and I haven’t killed anything with it yet. BIOS that allows disabling on a per core basis, not only per module. For the Asus Crosshair V Formula, BIOS 9920 did the trick for me. In bios disable everything for power management including throttling. When you load windows you should start with a consistent CPU frequency in CPUz. If its fluctuating go back to BIOS to disable the right stuff. If your motherboard and BIOS has the ability to disable on a per core basis, turn one core on in two different modules. You need one core per module so that you can change frequency of each core independently. On bulldozer you cannot change frequency independently for cores within the same module. If you are overclocking both cores and not only one you will have a harder time hitting higher frequencies. In PSCheck, go to File>Settings and select the PState Configuration tab. Place a check next to “all” in the left side panel to select all cores. On the right side panel, deselect the enable checkbox for Pstate Pb0 and Pstate Pb1. Then select the Boost Configuration tab and place a check next to “cpbdis” (disable cpb) near the top. Finally, click Save CPUs and Exit. This ensures you get consistent frequencies from your PSCheck settings, without any throttling or jumping around to cause instability. Go back to File>Settings and select the Pstate Configuration tab. On the right hand panel in the “Pstate P0” row, select your desired multiplier setting under the CPUFID column. To know what multiplier setting you want, look at the frequency column to the right after you choose a setting – the value in the frequency column divided by 200 is the multiplier that will be set. Once you have the multiplier you want, save cpus and exit. Ignore all other columns/settings. This saves the multiplier setting, but IT DOES NOT APPLY IT YET. To apply the multiplier setting you selected, on the main PSCheck window under “Processor Performance States” there should be two columns labeled 0 and 1, for each core you have enabled. In order for your multiplier to be applied, you must toggle the setting for core 0 from Pstate P0 to Pstate P1, then back to Pstate P0. Ensure CPU-NB does not limit you: Set CPU-NB in BIOS to a relatively low multiplier, as its frequency will increase when you raise FSB. Run generous volts. I like to keep CPU-NB between 2600-4000MHz when FSB is increased, and I run 1.5-1.6V when going for max frequency. Extra CPU-NB volts may help when more vcore does not; it helped me validate 7GHz on Phenom II. I haven’t found if it definitely helps on Bulldozer however. Ensure HTLink does not limit you: Set HT Link in BIOS to a relatively low multiplier, as its frequency will increase when you raise FSB. I like to keep HT Link between 1800-2800MHz when FSB is increased. Ensure RAM does not limit you: Set RAM multiplier as low as possible. I used 1066. Loosen timings, run generous volts. Max CPU Multiplier: Set vcore to 1.8V, set CPU-NB to 1.5V, then using PSCheck Set CPU Multi to the maximum setting it can do. For Bulldozer this was 31.5, which meant I started out at 6300MHz. If you have done everything right so far, these settings should get you comfortably into the 7 GHz. Max FSB: Start at a frequency of 7000/multiplier (7000/31.5 = ~220MHz). Increase FSB in increments of 5Mhz, until it crashes – this is quicker if you have a good software tool like TurboV or ROG Connect. Once it crashes, increase vcore by .05 or .1 (what you are comfortable with), then try to max FSB again, going in 1MHz increments once you get close to the frequency you crashed at before. Once you crash again, either increase vcore again or move on to the next step. Reduce Multi by .5, Max FSB: Same as before, but your FSB will be higher this time. See if you improve your CPU frequency using this slightly lower multiplier. Repeat step 6 as necessary. During the last few steps, tweak voltage settings as desired to get the last drop. 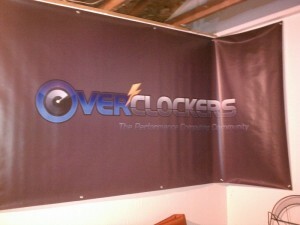 That’s how I got the highest CPU Frequency score on Overclockers.com, and the 17th highest in the world. Now come and get me! I went from 1.8V to 2.1V on vcore. On the FX-6100, from 1.9-2.1V was just making sure I couldn’t get any more out of it on multis between 30-31.5. My highest frequency was 7744MHz at 1.872 vcore. On the FX-8120, 2V ended up helping on that chip. Testing for the limits of your particular chip is the only way to be sure you have maxed it out. I only maxed one core, the other core sat at a comfy/stable 5-6GHz. All other cores were disabled in BIOS. You may read elsewhere that PSCheck can kill your CPU if you use certain cores or modules or whatever. I don’t believe that is true. I do believe that sometimes chips just randomly die when you are putting 1.8-2.2V through them. But PSCheck could have bugs that make sea-pea-uze asplode, dunno as I haven’t experienced them in my overclocking. Thanks guys. Its everything a person needs to know, after this, it's just a matter of finding the right chip. This is crazy but awesome! 8ghz!!! men that's wow! :clap: Congrats & Cheers! The point is to see how far the hardware will go, that's all really. No one will ever run the PC that fast for it's entire life; the PC was just stable enough to load the OS, increase the FSB/bclk, and open CPUz to validate. An old, used pot/evap can be had for ~$100, but new ones can cost over $200. LN is usually $1-2 per liter; dry ice can be had at Publix for $1.50 per pound. The point is just to enjoy the hobby really. The score is just to try to set records by seeing how far your hardware can go if ran correctly. We have a benchmarking team here so as a group we all compete against eachother, and against other benchmarking teams. I do it because there have been over 60,000 CPU frequency submissions at hwbot.org. Out of those submissions, I'm currently ranked 13th. I think that is kind of neat. The challenge along the way was the best part though, even if I never got that high of a score I've had a fun time learning - finding other guys around here to teach me, learning how to insulate, learning how to run the system on LN2... figuring out which voltages it helps to tweak, and what combinations of frequencies work the best. So if you were just starting out, you'd see how high your clock speed can go on air cooling. Then maybe you'd see how high you can set it and still run superpi or wprime. Then maybe you'd try out watercooling and see if that increases your limits. Ultimately if you are into the tweaking, you run benchmarks just for the fun of the hobby and competition, and compare your scores to everyone else running those same benchmarks on hwbot.org. As for cost, I paid $300 for a 50L container I can get filled with LN2. I paid a bit over $200 for a copper evaporator to mount on my processor and pour the LN2 into. I pay 75 cents/liter for the LN2 each time I get my container filled up. It was expensive starting out to get the container and the cooler. But for less than $40 for 50 liters, I can spend a few nights playing with a computer thats on the very edge of stability and see what I can make it do. High FSB and lower multi did the trick, just had to figure out what this new CVF liked. Wow! Still improving. keep it up man! thanks :) still going to make one more attempt, just need to find the time.